There is nothing worst than cold, painful feet when your focus is on getting work done. If the conditions are harsh, it’s easy to put on another sweater, but you can’t put on a second pair of boots. When you need all-day protection from the elements, the right insulated work boots are a necessary part of your cold weather gear. It’s easy to assume that your general-duty work boots will be good enough year round, but proper insulation requires layers. Warm socks can help but the extra insulation of insulated boots give you the edge you need for long days in the cold, ice, and snow. 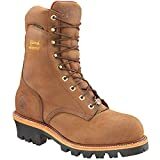 Approximately 7.5" from arch Heel measures approximately 1.25"
Timberland is one of the most trusted brands of men’s work boots. 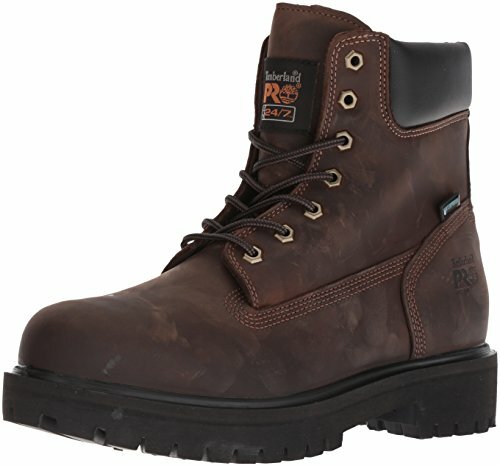 Join the countless other satisfied owners of Timberland Pro with the classic styling of the Direct Attach work boots. Timberland PRO rubber outsole is slip-, oil- and heat-resistant. Gear up for your next adventure with durable men’s boots from Keen. Waterproof breathable membrane locks out rain and humidity, but releases the heat and perspiration. Dry-Lex footwear lining with hydrophobic/hydrophilic 2-zone comfort technology. Metatomical footbed design is anatomically engineered to provide excellent arch support while cradling the natural contours of the foot. Oil and slip-resistant non-marking rubber outsole meets or exceeds ASTM F1677-96 Mark II non-slip testing standards. Soft toe meets or exceeds ASTM F2892-11 EH Standards for electrical hazard protection from open circuits. 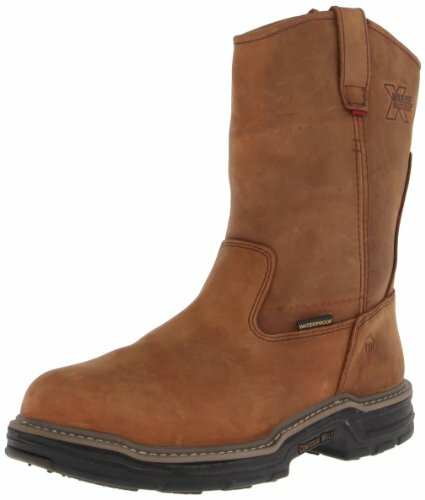 Open at the top, comfortable from inside – These work boots are best for working outdoors in extreme temperatures. A warm, insulated work boot that offers shock absorption and a protective toe for working all day. Chippewa Classics represent the best of class in components and classic styling for everyday wear. These Chippewa Loggers contain 400 grams of 3M Thinsulate Ultra Insulation. Dri-Lex delivers heightened comfort through a moisture management lining system that is totally breathable and quick drying. The Chip-A-Tex waterproof membrane system is breathable. Water is locked out of the boot by the membrane shield but air passes through from the foot for maximum comfort. Even when temperatures fall, you need to be protected by your winter work boots. Your feet want to stay warm, dry and healthy. Insulation: There are several types of insulation that can be added to give you the extra layer of protection you need in cold weather. Thinsulate and Thermalite are two of the most popular insulation materials available and they come in different levels from 200 grams to over 1000 grams. Most boots use one of these options. Waterproof: Cold weather often also means wet weather. Regardless of the temperature, the last thing you want in a long day is wet and uncomfortable feet. Waterproofing can happen at both the exterior and interior of the boot. While most people focus on the exterior, moisture-wicking membranes inside of the boot can be just as important to keep the environment around your feet comfortable. Good Grip: Work boots need to have good grip so that you do not fall when you are focused on your work. The rubber sole has to hold on to the ground whether you step in water, ice, oil, or grease. Comfort: Assuming your feet are warm and dry, comfort depends on cushioning and insoles so that you can work for long hours without suffering any pain. A good pair of warm socks is also important to your overall comfort. Heated socks raise your comfort to the highest level in the coldest temperatures. Nylon shanks: The shank in work boots is there to provide support in the sole. While they can be made from different materials, nylon is lightweight and will not transfer cold from outside into the boot while reinforcing the structure. Safety: Your feet also need protection from the work you are doing. 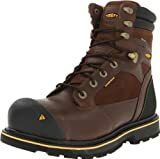 Steel and composite toes keep you safe from bumps or heavy objects falling although composite are better are at preventing cold temperature transfer into the boots. Electrical hazard (EH) rating is designed to protect you from electrocution. Price: Prices vary across different makes and models of boots, and it is possible to get both quality and value in your next pair of boots. Remember, however, that you rely on your boots to protect you for long hours of hard work. The cheapest boots may not offer the best protection or comfort and paying a little more may go a long way to keep you comfortable and protected. Frostbite is an injury caused by the onset of freezing of the skin and underlying tissue. First your skin becomes very cold and red, then numb, hard and pale. Frostbite is most common in the extremities such as fingers, toes, nose, ears, cheeks and chin. Frostbitten skin can be painful and have a prickling and irritating sensation. Frostnip is the milder form of frostbite and does not cause permanent damage. Trench foot is a condition caused by prolonged exposure to cold and wet conditions. Blisters, blotchy skin, redness, and dead skin are all symptoms of this problem. Protective boots and dry socks will help to prevent these issues. Toenail fungus is more common in cold weather because nails become more dry and brittle. If your socks don’t wick away sweat and moisture, athlete’s foot and toenail fungus can breed more quickly. If you have any kind of circulation issues, there are even more problems that can affect feet as blood circulation decreases. The right foot wear and proper planning can ensure that none of these issues affect you. With the help of an insulated pair of work boots, you can protect your feet and stay warm all day regardless of how long you work. Insulation adds warmth to keep you comfortable. 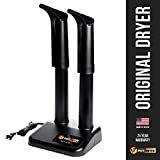 This feature works with the waterproof outer layers that repel both cold water and cold temperatures to protect your feet. Insulation is measured on a scale from 200 to 1000 grams. The required amount of insulation depends on the activity you are doing. Very active people who are on the move may require less insulation since there will naturally be more blood flow. Sedentary activities that force you to stay in one spot without much movement may need higher insulation to keep the feet warm. 200 gram Thinsulate insulation works well at the start of the cold season. This amount of insulation is light weight and thin, taking very little space. If your activity level is high then you generate plenty of your own heat and will need less insulation. 400 gram Thinsulate insulation is the next level and will keep you warmer as the temperature drops. This level of insulation is very popular and covers most winter situations. 600 gram Thinsulate is recommended for cold conditions or when the activity level is low. If your work requires sitting or standing in the same place more often, you can count on this level of insulation to keep you warm. 800 gram Thinsulate insulation boots are for very cold conditions. Sitting or standing or very cold weather means less blood flow to naturally warm your feet. 1000 gram Thinsulate insulation is the highest level and is usually worn only in extreme cases. 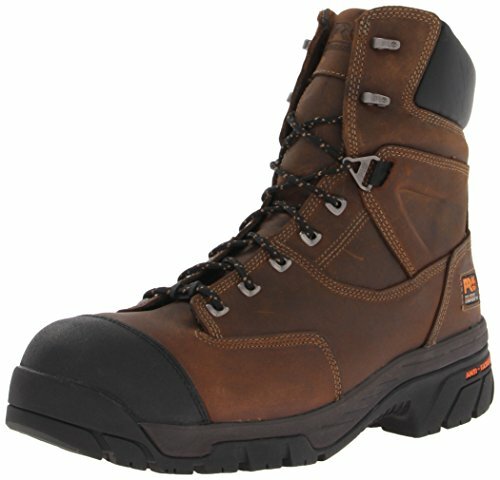 The ultra insulation of these work boots will keep you as warm as possible. Timberland PRO Direct Attach 6" Waterproof Insulated Boot $$ Leather Slip- and puncture-resistant work boot Rubber sole Black, Wheat, Brown 6"
KEEN Men's Sheridan Composite Toe $$ Leather Water Synthetic sole Cascade Brown Shaft measures approximately 7.5" from arch Heel measures approximately 1.25"
Timberland PRO Men's Helix 8" Insulated Composite Toe $$ Leather Slip-resistant outsole , Waterproof Rubber sole Brown 8"
Chippewa Men's 9" Waterproof Insulated Steel-Toe EH Logger $$$$ Leather Water Synthetic sole Bay Apache 9"
If you need to work in cold conditions and keep your feet protected no matter what, then you need the right pair of insulated work boots. With good waterproofing, the right amount of insulation, and features that keep you comfortable, your boots will help you to get through any activity without the distraction of cold, wet feet.